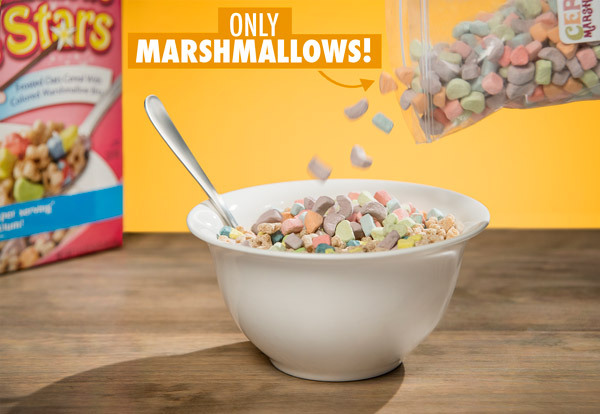 Just Cereal Marshmallows: A whole bag of only cereal marshmallows! Cereal marshmallows are the best. But getting them typically requires sorting through a lot of healthy nonsense like toasted oats, grains, and fiber. No more, amigos! Just Cereal Marshmallows are the delicious, tasty, cereal marshmallows you love and absolutely nothing else! 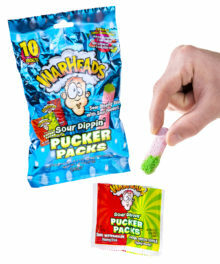 Each 6-ounce bag contains approximately 1,200 colorful, melt-in-your-mouth cereal marshmallows which are perfect for injecting your favorite cereals, cocoas, and party mixes with a ton of sugary goodness. Note: During the summer, increased humidity makes this product "squishier" than normal. This is unavoidable. Cereal marshmallows are fantastic. However, most cereal makers skimp on their marshmallows. C'mon guys, we want a healthy dose of mallow per bite! With Just Cereal Marshmallows, you can finally remedy this mallow deficiency. These sweet and tasty little marshmallows are just like the ones you find in cereal—except that they're already separated! Just open the bag and pour pure awesome onto your favorite cereal! 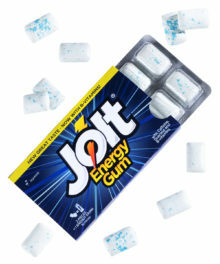 These are the same as the marshmallows you find in breakfast cereals minus all of those pesky oats, grains, and fiber. 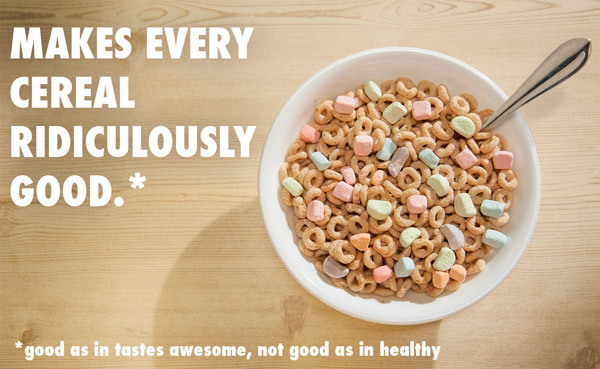 Cheerios™ (so good for your heart) + marshmallow (so good for your tongue) = freakin' unbelievably tasty. 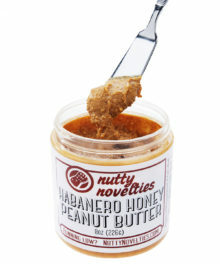 Seriously, you cannot go wrong with this product. If you added them to a cup of milk, you'd swear you were guzzling straight from the fountain of youth. 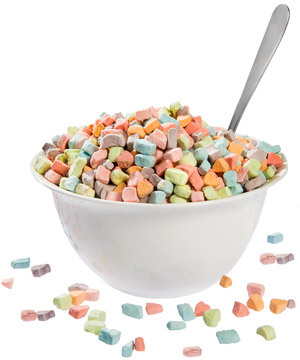 Enjoy your favorite cereals in a new way by adding Just Cereal Marshmallows. Try them in other foods, too! Just Cereal Marshmallows are also amazing in hot chocolate, ice cream, frozen yogurt, and snack mixes. You can also munch on them straight up. 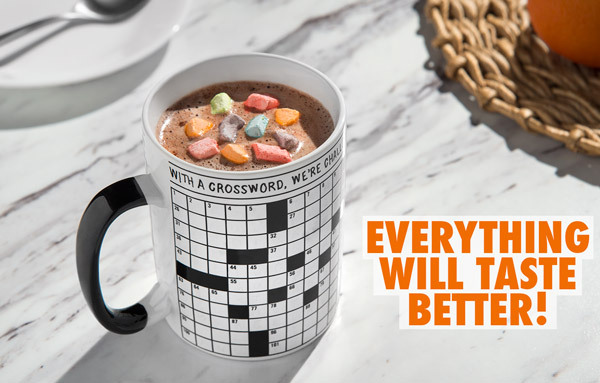 I mean, who hasn't eaten all of the toasted-oat pieces from their Lucky Charms just to get spoonfuls of the marshmallows? Exactly. These marshmallows aren't just for cereal. 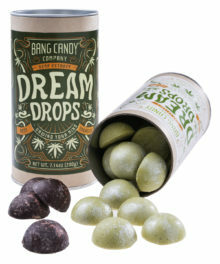 Try them in hot chocolate, ice cream, and more! 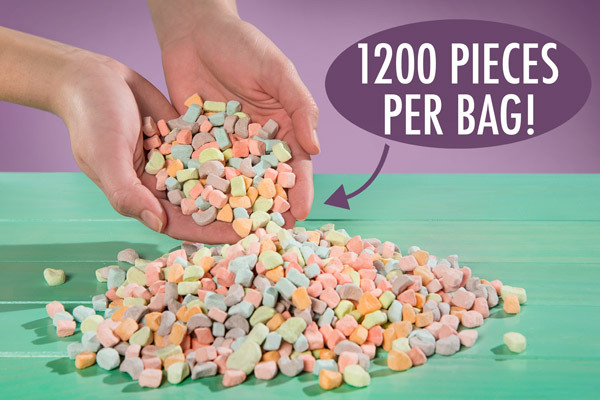 Each pack of Just Cereal Marshmallows includes approximately six ounces, or 1,200 pieces, of the yummy morsels that you can employ to marshmallow-ify your favorite foods, desserts, and cereals. Each packet includes approximately six ounces of the good stuff. We built a gigantic bowl, a 6-foot long spoon, a giant cereal box and then... we dived in! We poured over 700 lbs of Cereal Marshmallows into that bowl! Answer: Sugar, modified cornstarch, corn syrup, dextrose, gelatin, sodium hexametaphosphate, artificial color, (red 40, yellow 6, blue 1, yellow 5), artificial flavor, natural flavor. Question: Are these like Crunchmallows that you used to carry? 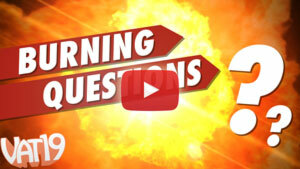 Answer: Yes. Like Crunchmallows, Just Cereal Marshmallows are meant to taste like the marshmallows you find in the off-the-shelf cereal, but now they come in a pack over three times as large. Bigger is better!